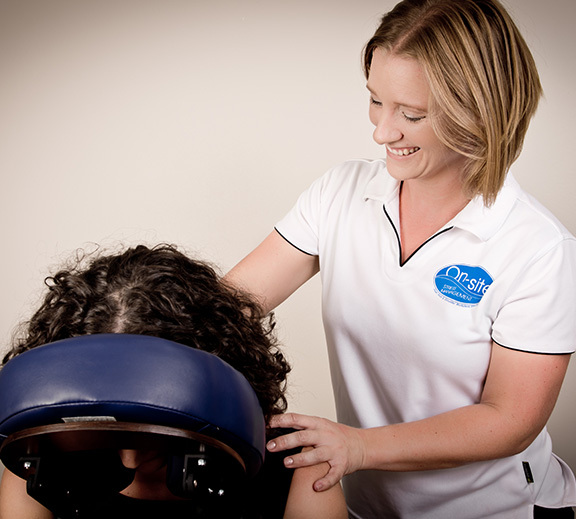 Established in Perth more than 15 years ago, On-site Stress Management is one of the original corporate massage providers in Western Australia. Throughout the years we have grown and expanded to incorporate other states and wellness activities but, providing a simple, reliable and cost-effective service for our clients remains our priority. On-site Stress Management is based in Perth, with fantastic teams also located in Melbourne, Brisbane, Gold Coast, Sydney, Canberra and Adelaide. The On-site Stress Management team is led by owner/manager Anike Senior, who has been working in the corporate massage industry since 2003. Anike’s background in Sport and Exercise Science (BSc) compliments her interest and qualifications in massage therapy. Although predominantly focussed on corporate (seated) massage, Anike also holds qualifications in sports and remedial massage, as well as several national coaching accreditations. On-site prides itself on its team of friendly, professional and highly skilled wellness professionals. Many of our team have backgrounds in complementary fields such as; Sport And Exercise Science, Anatomy and Physiology, Nutrition, Nursing and Personal Training. On-site Stress Management staff maintain current Senior First Aid qualifications, and are insured for both public liability and professional indemnity.